A reader has sent in these pictures of a badly fire damaged TO35. 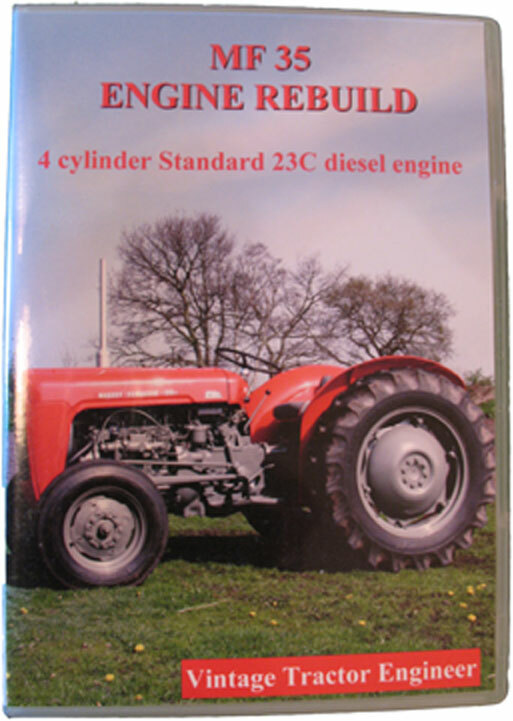 This tractor has the Standard 23C 4 cylinder diesel engine and we hope that the engine rebuild DVD will come in useful in the tractor’s restoration. 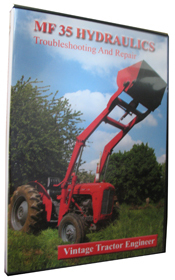 Vintagetractorengineer has a great deal of respect for anyone who is dedicated enough to undertake such a huge tractor renovation project (that many people would not even consider starting!). No doubt there will be many weekends and late nights spent on this tractor over the coming months. The Friends of Ferguson Heritage have a good list of suppliers from around the world for new/second hand parts, decals and other information. These guys seem to stock a good range of parts and the prices are published on the web. As we can see from the pictures, the fire will necessitate replacement of parts that may otherwise have been serviceable. The TO35 was built in the US and so we don’t see them in the UK, however we believe the tinwork and the wheels should be in grey and the castings painted green. If anyone knows better then let us know. Good luck Kevin and let us know how you progress. As far as I know the early TO35’s were grey with green castings and the later ones had red tinwork and wheels with grey castings. 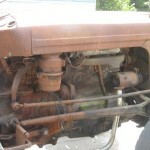 When i was a boy we had a 1955 TO35 deluxe, the sheet metal was grey and the casting was green. you can still get the correct paint. My TO35 is painted construction yellow, and the second owner from whom I bought it says that was the original color. Also, I’ve seen them with a beige or tan and red color scheme and a red and grey. Can anyone tell me how to get the pump out of TO35? I have a new one ready to go in, but the collar on the front side of the shaft doesn’t go forward enough and I am afraid to force it. Is there a trick? Thanks in advance for any help you might offer. I’ve purchased an unknown year (plate gone) Harry T. Ferguson TO-35, I beleive to be a ’56 Deluxe, 2 stage clutch, and looks to have been Industrial Yellow originally, and was cover painted over gray. Appears to have oversize tires for the model. It has had the Conty Z-134 engine replaced 3-4 years ago and has strong oil pressure. When whoever did the work, they put it back together PTO coupler backwards, and I had to have that taken care of, repaired, and reassembled correctly. Seems to have a weak 3pt lift pressure though, should have the Hydraulic Pump rebuild kit done. Don’t know if I’ll keep Harry T. or sell it away. My father and I recently purchased a 1955 Ferguson TO35. We have affectionately nick named her “Fergie”. We are currently giving it a fresh paint job, replacing all the gauges and cables, changing all the fluids etc. We were looking for a small “utility” tractor for running a 5 foot roto-tiller in small food plot areas on our hunting land. We fell in love with the slow crawl of first gear in low which is perfect for roto-tilling. The tractor we purchased was converted over to 12 volts and has a super smooth running strong engine. We also love the dual stage clutch which allows for transmission shifting without disrupting PTO engagement. This tractor has the grey tin and green castings paint scheme mentioned in earlier posts. After some restoring we hope to put her back to work for many years to come. This site has the colour schemes for all TO models. Our 1959 TO35 SDM192XXX 23C is red tin, gray casting. As far as I know no tractors left the factory with gold castings and red tin work. 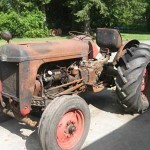 However, we have had an email from a gentleman in Australia who bought his tractor brand new in 1958. This tractor was painted red tin work with red castings. 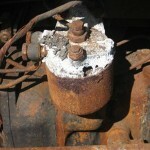 Where the red paint has worn off the castings over the years, there is definately gold underneath. THAT IS A FACT. Now the next bit is only presumption….. So, we presume that it was painted gold (the castings) in the factory, but was over-painted red before it left the factory after the change over from Ferguson to Massey Ferguson. Thanks for taking the time to describe your tractor. I’ve seen pictures of the green bellies on the internet, but never seen one here in the UK. Good to know that the tractor is still working and doing some useful work around your place. 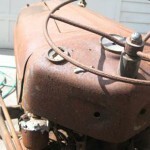 My father and I own a 1955 to-35 gas eigine.The orginal colours are green castings and grey tins. I have heard this was done for 55 and 56 and were called “green belly” by farmers.We use the tracter still to hual fire wood,blow snow,bush hog and scraper blade.It has always been reliable and runs great.It can be hard to start sometimes you have to talk to her nice she will eventualy start.My father bought it around 1973 when I was 3yrs old and have been using it ever since.It probaly could use a rebuild soon. As far as I know (Explained to me by my Dad, who has an FE35), the Massey Ferguson TO35 wasnt made until 1957. That was the only year they (they were exactly the same) were made in the US at the same time as the Ferguson FE35 was being made in Coventry England. The last run of production at Coventry started in October 1956 (the month I was born). The motor and castings of the FE35 was Gold. All the tinwork and wheels were Grey. I know that for sure. I have a mate with a MF 35 Badging (TO35)and his is grey tin/wheels too. 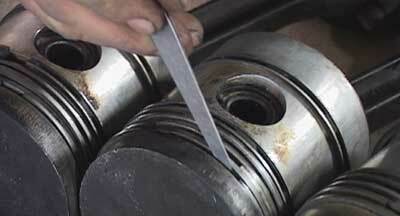 But the motor/ castings are grey and I cant find any evidence of gold under the grey paint . That tractor is damaged big time! But it is still doable!